The summer holiday season is about to go into overdrive and we’re urging people not to forget about their pets in the rush to get away. Martin Leith, our clinical director, has issued a timely reminder of what needs to be done if you’re planning to take your pet abroad with you. Top of the list is making sure your animal is microchipped, has an up-to-date pet passport and the necessary vaccinations to go with it. 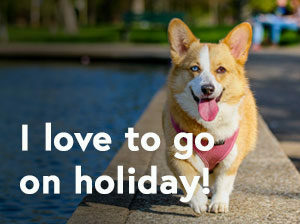 Martin said: “If you’re taking your pet abroad with you this summer then don’t leave it until the last minute to make all the arrangements as it could be too late. “For instance, the required rabies vaccination has to be carried out 21 days before departure. “Pets should also be treated against the threat of tapeworm before they go away so, again, my advice is don’t delay. The full rules and regulations for pets travelling abroad can be complicated, as they differ depending on your destination and whether it is an EU country or outside the EU. Martin is advising pet owners to check with their vets to make sure they have everything up to date and covered in order to avoid having the heartbreak of leaving their beloved dogs and cats behind.